The fauces is decorated in the fourth style with yellow panels separated by broad bands of red above a lower red frieze. The fauces has a black and white mosaic floor featuring the well known mosaic of a dog on a chain (shown below), bearing the warning cave canem, 'beware of the dog'. The fauces (pictured right) leads directly to the atrium (c) which has a central, marble lined impluvium. At the north end of the impluvium is a marble puteal used for drawing water from the cistern beneath. The atrium, unlike most other houses in Pompeii, was richly decorated with six large frescoes depicting scenes from the Illiad. On the south wall two of the frescoes framed the entrance (pictured right). The fresco to the left of the entrance was of the Nuptials of Zeus and Hera on Mount Ida (pictured above) in which Hypnos presents Hera to the seated Zeus. The picture on the right of the entrance was possibly the Judgment of Paris, but unfortunately it is now lost. Of the two frescoes on the west wall sadly only fragments remain. One of the pictures may have been of Thetis and Achilles, but too little of the second fresco remains to identify it with any certainty. In the south west corner of the atrium is the porter's room (d) next to a flight of stairs to the upper floor. On either side of the atrium are two cubicula (e), both of which are simply decorated in the fourth style with red and yellow panels above a lower red frieze. Next to the cubiculum on the west side is a storeroom (f) while opposite it on the east side is an ala (g). To the rear of the atrium is the tablinum (h). The tablinum is decorated in the fourth style with an orange central zone above a lower red frieze. On the east wall was the fresco, now in the Naples Museum, after which the house was mistakenly named. The subject of the fresco (pictured below) is the delivery to Admetus of the oracle which declared he must die unless someone volunteered to die in his place. On the west side of the tablinium a door opens directly onto a cubiculum (i) while to the north a wide opening opens onto the peristyle which is colonnaded on three sides (pictured opposite). In the centre of the peristyle is a small garden and against the rear wall a temple style lararium (k) in which was found a small marble statue of a satyr bearing fruit. Three further cubicula (l), (m) and (n) open off the peristyle while in the south east corner is the kitchen and latrine (o) (pictured below). In the north west corner of the peristyle is a posticum or secondary entrance (q) which opens onto the Via della Fullonica at No. 5. The House of the Tragic Poet, excavated in 1824, lies at the corner of the Via delle Terme and the Via della Fullonica, across from the Forum Baths. 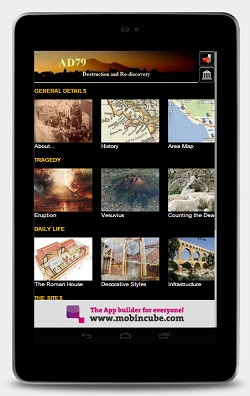 It is a small, but excellent example of a Pompeian house in the Imperial age. 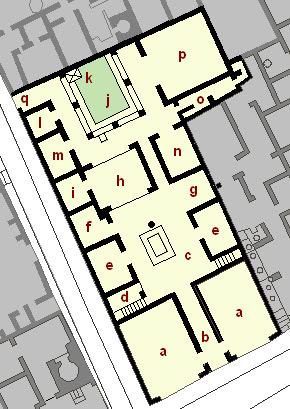 The house, which was built in its present form around the end of the first century BC, has the classic layout of a Samnite House. The large, single roomed shops (a) which lie on either side of the entrance were presumably managed by the owner of the house as each has a narrow door (visible in the picture below) opening onto the entrance corridor or fauces (b). The frescoes on the east wall fared much better. The first one, of Helen and Paris, shows Helen boarding ship to return to Troy (pictured opposite). Unfortunately only half of the fresco has survived, but it is thought that the missing right hand portion showed Troy already seated on board. The final fresco shows the delivery of Breseis to the messenger of Agamemnon. In the detail from the fresco below, Achilles, who is seated, is counselled by his faithful companion Phoenix before ordering Patroclus to hand over Breseis. All three surviving frescoes were removed a few years after their discovery and can now be seen in the National Archaeological Museum in Naples. What is left in-situ is now badly faded despite the fact that the house was roofed over in the 1930's to protect it from the elements. The excavators thought the scene represented a poet reciting his verses and since they found on the floor of the same room a mosaic portraying an actor making preparations for the stage, they concluded that the figure with the papyrus in the fresco must be a tragic poet. The tablinum (pictured below) has a fine black and white mosaic floor with a geometric motif which had, at its centre, the afore-mentioned mosaic scene (pictured lower left), now to be found in the Naples Archaeological Museum. The triclinium (p) opens off the north east corner of the peristyle. Decorated in the fourth style each of the three walls contains three yellow panels separated by scenes of fantastic architecture above a lower black frieze (pictured below). In the central panels on each wall are large mythological scenes including that of Theseus boarding ship leaving Ariadne behind (picture lower left). The outer panels contain the Seasons represented by floating figures. Beyond the triclinium, on the rear wall of the peristyle, was a fresco (below and bottom left) known as the Sacrifice of Iphigenia, in which Iphigenia was to be offered up in sacrifice to Artemis in order that a favourable departure from Aulis might be granted to the Greek fleet assembled for the expedition against Troy. The fresco is now in the National Archaeological Museum.